Stateside snobbery to a Fawlt! 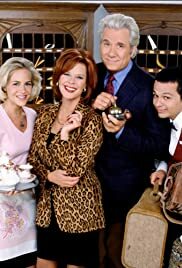 John Larroquette is delightfully rude and self-serving as hotel owner Royal Payne in this Yank version of "Fawlty Towers"! Certainly, his version of crass attitude is different from John Cleese's, as it should be. Some viewers might say that the relationship between Payne and his wife Constance (JoBeth Williams) seems too flexibly forgiving, but there IS a definite viper-like chemistry between the two, like a more sarcastic Nick & Nora Charles. I also like (even though it is a comic-relief ethnic stereotype) Rick Batalla's portrayal of Mohammad, the bumbling bellhop. Just like Manuel in "F.T. ", he is cringingly subservient to his boorish boss ... I'm waiting for a dressing-down scene of "This Royal's wife. This Royal. This smack on head." And Larroquette will give Batalla a smack on the head ... let's wait and see!